As I continue to lose weight, my biggest struggle has been getting cravings to have a snack in the evening even if I am not actually hungry. Despite eating healthy foods I know that even those calories can quickly add up if it is not needed by my body and ultimately will become stored as fat. For me recognizing that is much easier than actually controlling myself when those cravings hit! Redd Remedies is a holistic, natural health and wellness line of supplements that has a wide selection of products. 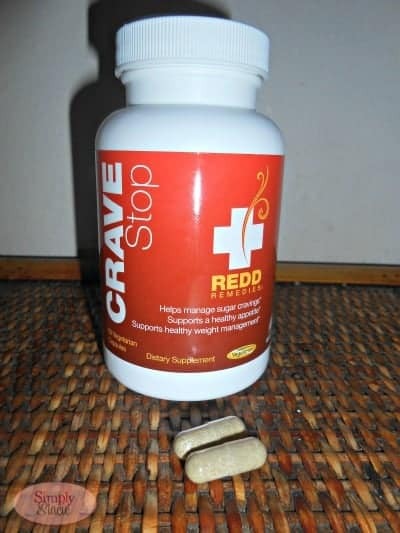 I was very interested in trying Crave Stop™ by Redd Remedies because this supplement is intended to target and control cravings. I appreciate that it is a naturally derived, holistic supplement using specially blended minerals and herbs to “help manage sugar cravings and support a healthy appetite while supporting healthy sugar metabolism, healthy adrenal function and healthy stress response.” It includes chromium, vanadium along with the Healthy Appetite Blend of Gymnema Leaf Extract, American Ginseng Root Extract and Banaba Leaf Extract. I firmly believe that a busy, stressful lifestyle (have I mentioned I have three young children all a year apart in age) has an impact on my overall health and well-being and has affected my ability to lose weight. I take one vegetarian capsule with a large glass of lemon water every morning and another capsule in the late afternoon/early evening. When I first starting taking this product, I still had that urge to have an evening snack in the evening when the kids were put into bed and I was somewhat better able to control that urge. However, after using Crave Stop™ for one week, I realized that I wasn’t heading to the refrigerator automatically every night at 9 p.m. Taking the product on a regular basis, I can’t say that I don’t ever have the craving to eat something when I am not hungry but I realize that it is just a bad habit and Crave Stop™ seems to have helped me to resist the urge. In fact….my weight has gone down an extra three pounds this month! Pick up your bottle of Crave Stop on Amazon. Connect with Redd Remedies on Facebook and Twitter. I’d like to try the UT shield. Would like to try the At Ease. those late night cravings are the worst! I’d love to try the At Ease product. Cholesterol Defense sounds pretty good. I’d also like to try the Brain Awakening caps. I’d love to try the trueENERGY. Sadness. Irritability. Apathy. Fatigue. Hopelessness. We have all felt these things from time to time. Some of us live these words every day and don’t understand why. I’d be interested in trying the Circulation VA. I would try Brain Awakening! I would also love to try the At Ease PM™ so i can get some truly restful sleep! I would like to try trueENERGY. I would love to try this product – trueENERGY.